Sometimes you post something on social media before you really give it a second thought (or a first fact-check). So we can relate to whoever is running ESPN’s Facebook account. 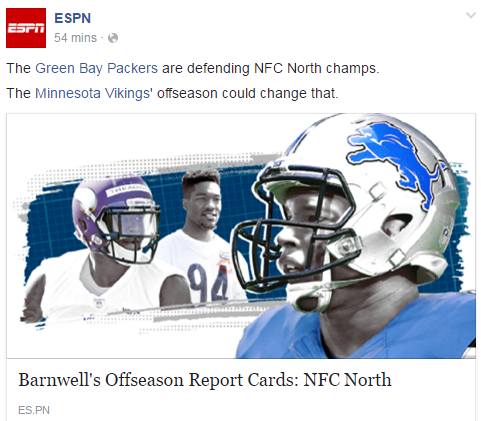 In teasing to a Bill Barnwell offseason report card story (Vikings get an A-minus, by the way), ESPN asserted that, “The Green Bay Packers are defending NFC North champs. The Minnesota Vikings’ offseason could change that.” As of the publication of this post, it was still live. Whoops. The Vikings, as many of you around here probably know, won the NFC North by virtue of beating Green Bay in the regular-season finale at Lambeau Field.